I have noticed Japanese Knotweed (I've seen it listed as: Polygonum cuspidatum or Fallopia japonica or Reynoutria japonica) around the county the last few summers, so I chose it as Tuesday's INVASIVE of the DAY for National Invasive Plant Awareness Week. 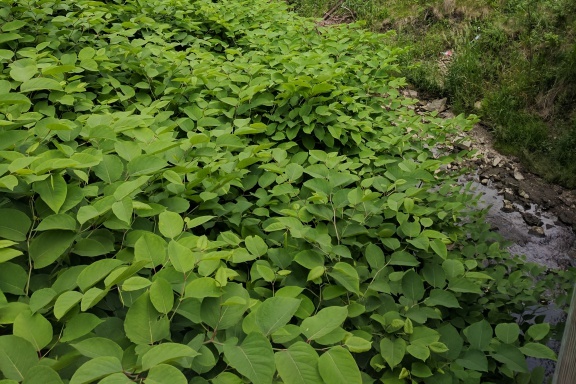 Japanese knotweed is a non-native erect, semi-woody perennial that can grow up to and likely beyond 10 feet tall and create dense stands when unchecked. It was introduced, as so many invasives were, as an ornamental in the late 1800's and soon escaped the garden-scape and found its way into disturbed areas. It is found "from Nova Scotia to the Carolinas, West to Minnesota and Iowa, Colorado, Utah" and even Washington and Northern California. Can we say, everywhere? Its bamboo-like, upright growth is what first catches my eye in spring as an easy ID feature. The stems are covered in purple freckles, developing a white "powder coat" that easily rubs off as stems mature. The leaves are triangular. Young Japanese Knotweed on a roadside. Photo Credit: Ashley Kulhanek, OSU Ext. At the time of this photo (Note the Eastern Redbud in bloom circa 191-245 GDD) the knotweed is already 1 foot tall and higher along this road. The canes are hollow like bamboo. Knotweed has rhizomes that can spread out to 60 feet creating a dense underground network, which can give rise to more plants. Any piece of rhizome left behind when physically removing can still produce a plant. Fragments of rhizome can enter streams or be carried on mowing equipment or in fill dirt, and spread infestations easily. Root pieces buried up to 1 meter deep can sprout a plant! And of course, the plant also produces wind-carried seeds produced from plentiful green-white flower stalks. Japanese Knotweed is not picky. While it prefers moist, well-drained soil (what doesn't? ), it can grow in a variety of places from drab roadsides to stream banks to woodland edges, full sun to partial shade. Its thick growth shades out native plants and also has allelopathic tendencies, preventing other plant from thriving. MANAGEMENT? Continuous cutting back of the plant can work to exhaust the energy stores but will take multiple seasons. Digging means labor, and any tiny root left behind will sprout another plant. Therefore a combination of chemical and mechanical control is a must. This is made more complicated by the fact knotweed is often near waterways where chemical use must be done carefully. The factsheet linked below offers detailed management information and active ingredients that have been successfully employed in reducing knotweed infestations. To reduce the spread of invasive plants, check yourself for seeds when out hiking, biking, or managing your yard or property. Clean your equipment before moving to a new location to prevent spreading seeds or plant parts that can vegetatively propagate a new infestation. Catch weeds early by being observant in your yards and parks. Hand-pulling and mechanical measures are more effective when managing small problem areas before they become established.